Certify Your Habitat to Help Wildlife! Wildlife habitat gardens are a haven for local birds, butterflies, and other wildlife. Tell us how your yard or garden provides habitat and the National Wildlife Federation will recognize it as a Certified Wildlife Habitat®. 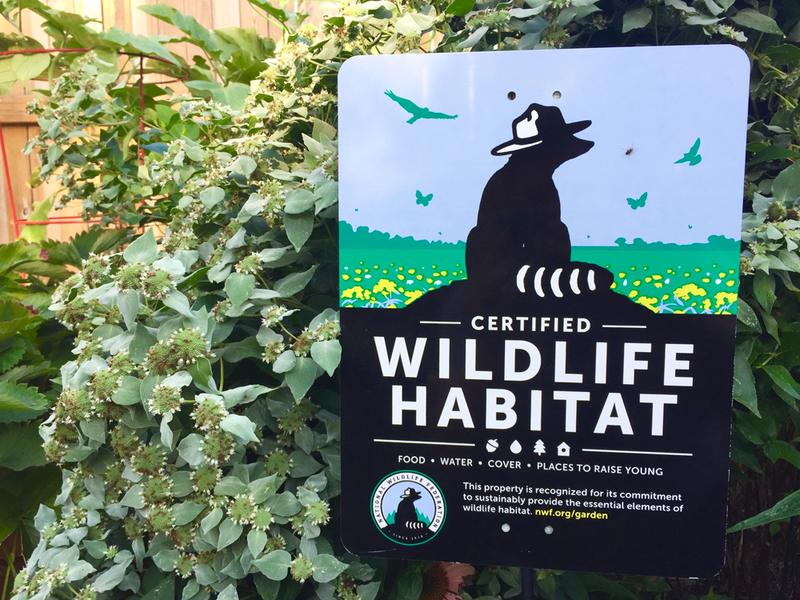 Once certified, you can share your accomplishment and commitment to helping wildlife with your whole neighborhood by purchasing and posting an exclusive Certified Wildlife Habitat® sign. The secure $20 application processing fee and sign purchase directly support the National Wildlife Federation's programs to protect wildlife and its habitat. Food: Native plants provide food eaten by a variety of wildlife. Feeders can supplement natural food sources. Water: All animals need water to survive, and some need it for bathing or breeding as well. Cover: Wildlife need places to take shelter from bad weather and places to hide from predators or hunt for prey. Places to Raise Young: Wildlife need resources to reproduce, and to protect and nourish their young. Sustainable Practices: Maintain your yard or garden in natural ways to ensure soil, air, and water stay healthy and clean.